You know nothing about PJ Harvey. There is no Google, no Wikipedia, no place you can turn to for information. The cassette from your pen pal is hand-labeled, so you don’t even have an album cover or liner notes. You can vaguely picture the poster at the local record store, but you’ve never examined it. You play the cassette. The first track begins with a muted guitar riff that emphasizes rhythm over melody. She plays low, single-string notes that one could almost play on a drum; the beat is tribal. A woman’s voice sings over the riff, full of restrained anguish. Then the drums kick in and all hell breaks loose. WTF was that? “Lick my legs” was so unexpected that you forgive PJ Harvey for rhyming “fire” and “desire.” You play the cassette again. And again. For months. It’s perfect. PJ Harvey remains a favorite through her 1998 album, “To Bring You My Love.” Now she’s doing the diva thing; she’s not the howling basement caterwauler you once imagined; but that’s okay: you’ve grown up a bit too. You see her once in concert at a large amphitheater as part of a bill with Veruca Salt (!) and she plays only six songs, this tiny figure in a red dress on a huge stage. After that you kind of forget about her. It’s PJ Harvey in 1993 on…Jay Leno? You must have missed that the first time around. You watch, hoping to unravel some of the mysteries of 1993-era PJ Harvey. Somehow it feels as uncomfortable as watching yourself on video. The camera is too close. The vocals are too high in the mix, like on the karaoke of American Idol. The loud/soft dynamic is neutralized. When she sings “Lick my legs” in her throaty, higher register, it almost comes across as farce. Like she knows it’s a weird line sung in a weird voice. When you heard this on your hand-labeled cassette for the first time, that voice sounded otherworldly, not quite human. 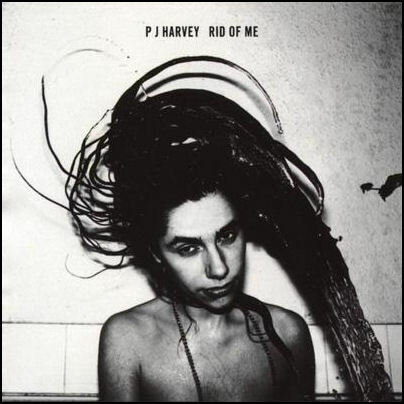 Now it’s clear that PJ Harvey was Polly Jean Harvey and all too human. Moments after performing her psychodramatic masterpiece, PJ Harvey sits down with Jay Leno to make small talk about sheep castration. The other guests are comedienne Kathleen Madigan and actor Michael Richards (whom Jay Leno mistakenly calls Michael Kramer.) It’s surreal, as seeing your adolescence repackaged and commercialized always is. You worry that this was PJ Harvey’s first introduction to millions of people and they did not get it. (Today’s analog is St. Vincent’s performance on SNL.) This happened 21 years ago but it still bothers you. This is 100% your problem, not PJ Harvey’s. She moved on many years ago. Today you accept that instant access to information is mostly a good thing. But you also miss not knowing things. When you had only partial information — a hand-labeled cassette, a scrambled image on a late-night cable channel — your mind filled in the blanks. It was possible that your favorite bands could be apocryphal — projections of your own psyche, not just a humans with guitars. Who could prove otherwise? You wanted so badly to know everything, but the years of not-knowing may have been the most formative. * One time you asked your dad what “correnulate” meant. He said he did not think that was a real word. The lyric you had misheard was “But it’s too late” from Black Sabbath’s “Paranoid” (“I wish I could / But it’s too late”). You went years thinking it was “correnulate” and that you just didn’t know what that word meant.